Caley Thistle overcame an early setback to triumph 5-2 against Betfred Cup opponents Cowdenbeath last night. 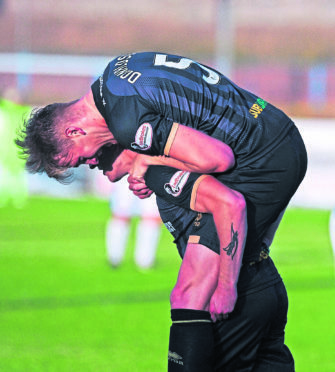 Jordyn Sheerin gave the hosts a shock lead but braces from Tom Walsh and Aaron Doran and a goal from George Oakley handed Inverness the points, despite a late second for Sheerin. The visitors made two changes from the 2-0 win over Cove Rangers, with summer signings Walsh and Jordan White handed their first starts in the place of Charlie Trafford and George Oakley. Sean Welsh, who joined the Caley Jags on Monday, was on the bench. Nathan Austin looked to continue his form from Saturday and had the first chance but was denied inside three minutes by goalkeeper David McGurn, who was out quick to block. White was given his chance in place of an Oakley, who frustrated against the Highland League champions, and was alert to Liam Polworth’s hooked cross, diverting it goalwards and forcing McGurn to help it over the crossbar. Cowdenbeath missed a glorious opportunity to open the scoring 21 minutes in after Coll Donaldson was caught out. Jordyn Sheerin manoeuvred into space and squared for an unmarked David Cox, who blazed high over Mark Ridgers from six yards. Sheerin made amends for his team-mate’s profligacy three minutes later with a wonderful strike, taking Bradley Smith’s pass and lifting an effort into the top corner past a stationary Ridgers. It took eight minutes for Caley Thistle to respond and they did so in clinical fashion. Walsh’s cross from the left was met by White, who headed back into the midfielder’s path and his driven strike was too much for McGurn to keep out. He duly doubled his tally four minutes before the break with a marvellous solo effort, intercepting a stray ball from Sheerin just inside the Cowdenbeath half and drifting forward into the box before sliding in off the post. Inverness were 3-1 up at the break thanks to Doran, who bundled home from White’s knockdown despite appeals from the Blue Brazil for handball. Robbie Buchanan’s deflected shot looped up and threatened to trouble Ridgers at the start of the second half but went wide, as Doran was denied a good shout for a penalty after tussling with Fraser Mullen. Doran was perhaps guilty of not following up his own chance on 58 minutes – he raced clear and attempted to jab past McGurn, with the goalkeeper blocking but sending the ball rolling toward goal. The Irish winger left it, content he had done enough, but Kyle Miller raced back to clear off the line. Oakley added a fourth with a well-taken volley after McGurn brilliantly kept out White before Doran unwittingly diverted Charlie Trafford’s long-range shot in. Sheerin capped off the scoring by netting at the near post on 81 minutes. There was still time for Tremarco to block a David Cox shot on the line as Inverness claimed the points. Cowdenbeath (4-4-1-1) – McGurn 6; Mullen 5, Marsh 6, Pyper 6, Talbot 5, Cox 6, Malcolm 6 (Scullion 86), Buchanan 6, Smith 6 (Muirhead 74), Scott 5 (Miller 56), Sheerin 7. Subs not used – Goodfellow, Fotheringham, Swann. Caley Thistle (4-4-2) – Ridgers 6; Rooney 6, Mckay 6, Donaldson 6, Tremarco 7, Walsh 7, Polworth 6, Chalmers 6, Doran 7, Austin 6 (Oakley 67), White 7 (Trafford 73). Subs not used – Hoban, McCart, Welsh, Calder, Elbouzedi. Man of the match: Tom Walsh.